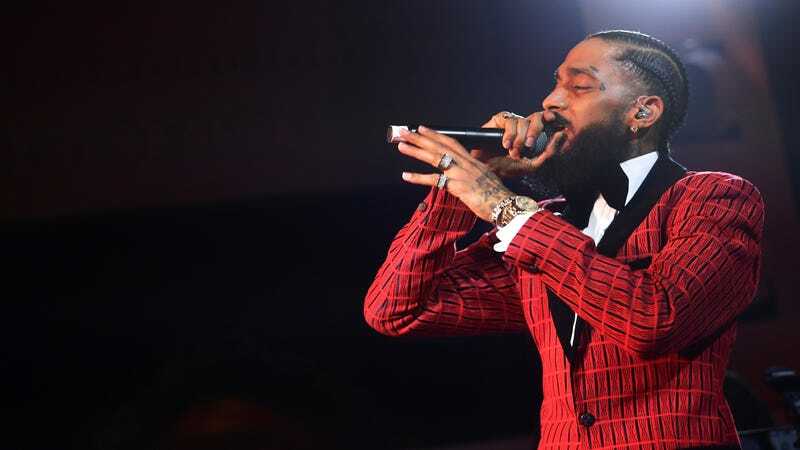 Nipsey Hussle, a Los Angeles-based rapper whose album Victory Lap was up for a Best Rap Album Grammy in 2019, was fatally shot outside his clothing store in South L.A. on Sunday. He was 33 years old. NBC reports that Hussle was shot at 3:20 p.m. PST, outside the Marathon Clothing Company in Hyde Park. He was pronounced dead at an area hospital, according to TMZ. As of Sunday evening, the shooter was still at large. Hussle, real name Ermias Davidson Asghedom, had a decade-long career in the Los Angeles rap scene, and worked with everyone from Drake to the Childish Gambino to Kendrick Lamar. He dropped a number of mixtapes over the years and released Victory Lap, his first studio album, in 2018. It netted him a Grammy nod, though Cardi B ended up winning the award for Invasion of Privacy. A number of artists offered online tributes to Hussle after news of his death broke. He leaves behind two children and his girlfriend, Lauren London.